This is the user ID you previously created. When you check this box, your User Name is stored in a cookie on your computer, and is filled in automatically each time you return to our site. For your security, you must still enter your password to log in. Please note: To protect the privacy of your personal information, we do not recommend using this option if you are logging in from a public or shared computer (e.g., in a school, library or internet cafe). At thousands of participating ATMs. access only on personalized cards. Text for balance, recent transactions, more. Carrier message & data rates apply. EVERYWHERE VISA® DEBIT CARDS ARE ACCEPTED IN THE U.S. Ask the cashier to add cash directly to your card at the register. Learn more. Reload fees and limits apply. Pay bills quickly and easily. * How can you get payroll direct deposit faster? Many employers notify the bank of PAYROLL direct deposits before your “official” payday. If we receive early notice, we’ll deposit your pay on the card early. Ask your employer when they submit their direct deposit information to the bank. Your employer may not submit early every pay period. The RushCard Live Prepaid Visa Card is issued by Green Dot Bank, Member FDIC, pursuant to a license from Visa U.S.A. Inc. Additional services provided by Green Dot Corporation. Green Dot Corporation is a member service provider for Green Dot Bank. The use of this Card is subject to the terms of your Cardholder Agreement. Green Dot is a registered trademark of Green Dot Corporation. 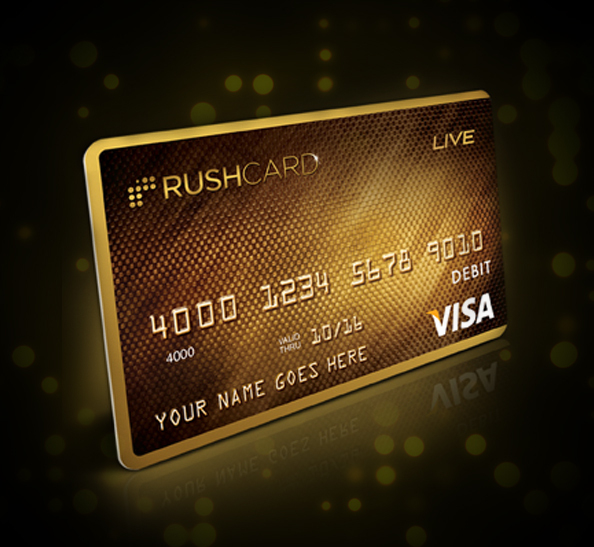 RushCard is a registered trademark of UniRush LLC.